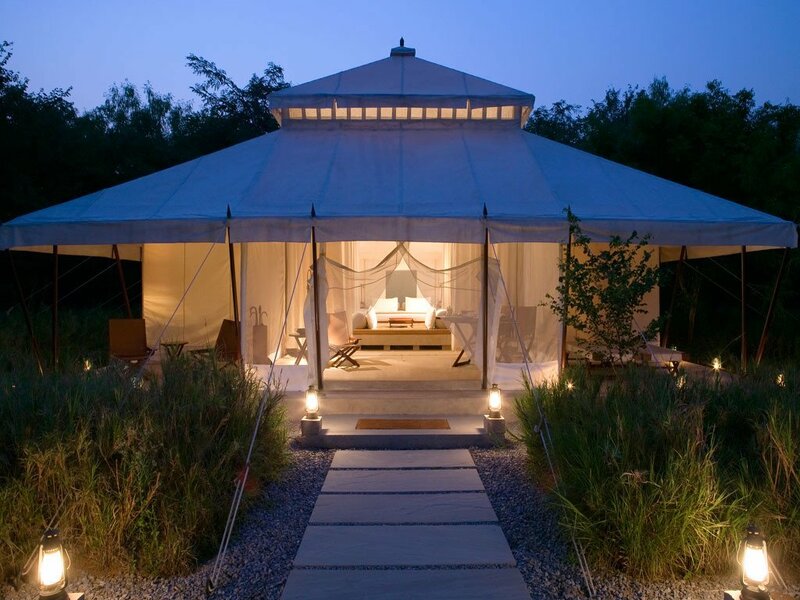 Glamorous camping, aka “glamping” in Rajasthan offers a truly luxurious experience. A far cry from “roughing it” in a flimsy tent in Cornwall, these glamorous tents are unashamedly opulent and a fantastic alternative to the regions palace resorts. Those seeking nature and wildlife on their India expedition will find Ranthambhore to be the perfect combination of rugged, natural beauty along with pure indulgence and luxury. Ranthambhore National Park is drenched in history, having witnessed many battles played out on its land, and the rise and fall of many rulers. The formidable 10th century Ranthambhore Fort is a magical backdrop, with its ruined pavilions, ancient Hindu temples and crumbling walls dotted throughout the jungle. India’s most fascinating and elusive wildlife can be found in the park, and the chances of spotting a tiger in the wild are amongst the best in the country. Just a stones-throw away from Jaipur, and a short train ride away from the Taj Mahal, Ranthambhore is India’s most accessible national park. It’s worth noting that each resort, along with the park itself, is closed from 1st July– 30th September each year, due to the heavy monsoon rains that fall during July, August and September. The resorts, along with Ranthambhore National Park itself, open once again on the 1st October. Arguably the most luxurious resort in Ranthambhore, and certainly amongst the most opulent in Rajasthan, Aman-i-Khás rests on the edge of Ranthambhore National Park. The name is formed from a combination of Sanskrit and Hindi, with ‘aman’ meaning ‘peace’ and ‘khás’ translating to ‘special’. The resort features just ten luxurious tents, in a tranquil and serene location. Each extravagant tent is inspired by the sumptuous Mughal travelling tents of a bygone era. 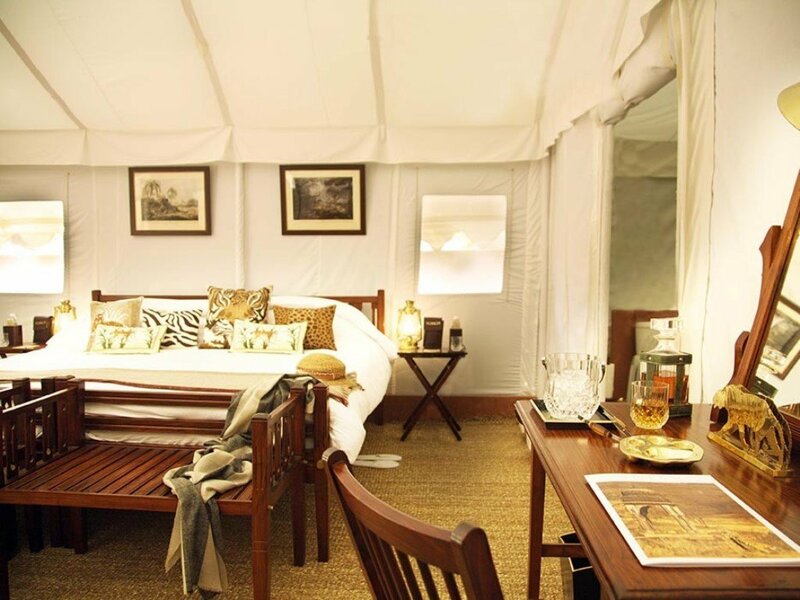 These huge tents offer several rooms, separated by fine flowing cotton drapes, including an individual dressing room and a veranda with luxurious over-sized daybeds – perfect for lounging and relaxing after a safari in the jungle. Each tent is assigned a personal butler, who is always available to meet your every demand. There are no telephones at Aman-i-Khás, but press the bell in your tent and your butler is promised to arrive within five minutes – no matter what time of day or night. The Aman-i-Khas in Ranthambhore was the venue for Russell Brand and Katy Perry’s exclusive Hindu inspired wedding, back in 2010. Tents start from ₹65,000 per night, exclusive of meals and taxes. 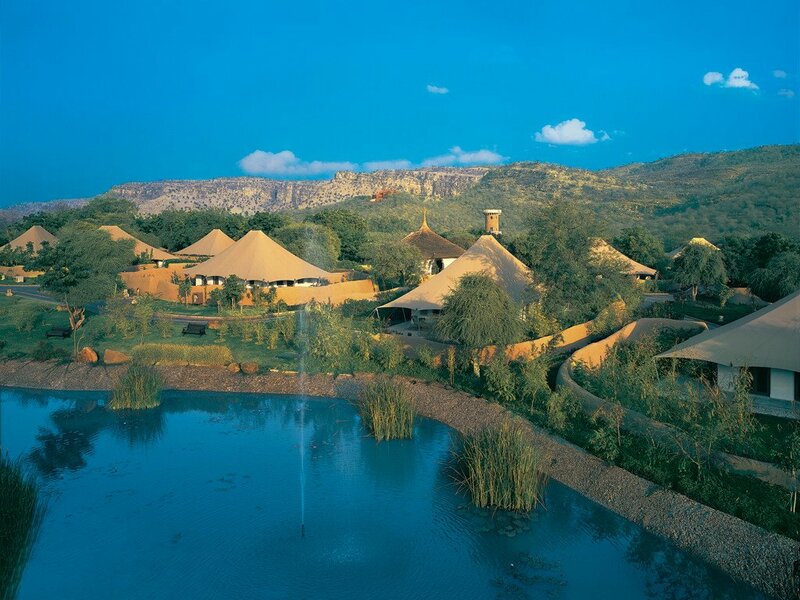 The perfect base from which to explore Ranthambhore National Park, the Oberoi Vanyavilas is truly something special, and offers the perfect contrast to the ruggedness of the jungle. Resting on the edge of the tiger reserve, the opulent Vanyavilas offers 25 ‘Luxury Tents’. The name ‘tent’ may be a slight misnomer here; the accommodations are royally luxurious, down to the four-poster bed, free standing claw foot-bathtub, polished hardwood flooring and rich embroidered canopy. After a few hours at the Vanyavilas, it’s not hard to see why the resort was voted as ‘Best Hotel in the World’ in 2010, by readers of Travel + Leisure magazine. A Luxury Tent at the Oberoi Vanyavilas will start from ₹45,000 per night, inclusive of breakfast and taxes. On the outskirts of Ranthambhore National Park, Sher Bagh is a true Jungle Book experience, bursting with charm and character. This enchanting resort most certainly brings the safari experience to life, even long after you’ve left the tiger reserve. Surrounded by deciduous forest, the eco-minded Suján property is comprised of 12 luxury tents, all resting around a central garden. It’s certainly not unusual to spot langur monkeys, strutting peacocks and spotted deer whilst strolling the vast, un-tamed grounds. Each tent has been inspired by 1920’s safari accommodation, favoured by the likes of Princes and Grand Seigneurs of the time. The hand-stitched canvas and Edwardian, campaign style, furniture evoke a nostalgic atmosphere of the Raj on safari. Tents at Sher Bagh start from ₹30,000 per night, inclusive of all meals during your stay, along with taxes. It’s worth noting that the Forest Department, responsible for conversation of wildlife in Rajasthan, have placed a restriction on the number of visitors permitted into the park each day. To avoid disappointment, it is recommended to book your jungle drives well in advance. There are two types of vehicle permitted into the park, a Jeep and a Canter. The Jeep is a six-seater vehicle, preferred by many. The Canter is a 16-seater open-top bus. The Jeep offers a much more intimate safari experience, as the small size of the vehicle means it’s perfect at navigating into small paths and nooks in the jungle. Jeeps are typically shared amongst six tourists, although the vehicle may be hired privately if you purchase all six seats. A private Jeep safari really does enhance the experience, as you have much more space to be comfortable in the vehicle, and don’t need to consider anyone else during the trip. There are two safaris each day, one in the morning and another in the afternoon. Timings vary throughout the year in accordance with sunrise and sunset, but the approximate times are 6am – 10am, and then 2pm – 6pm. 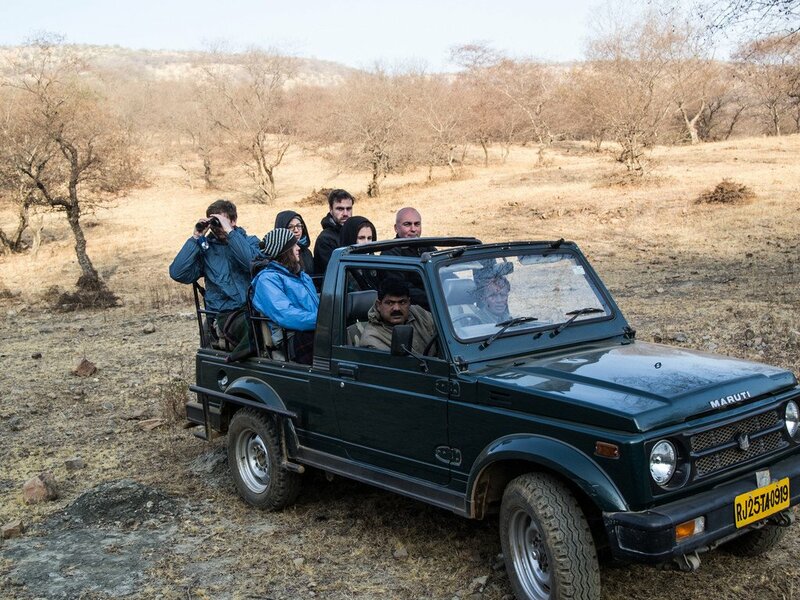 Tiger sightings of course cannot be guaranteed, so it is recommended to take at least two safaris in Ranthambhore National Park, to increase your chances of spotting the elusive tiger in the jungle.